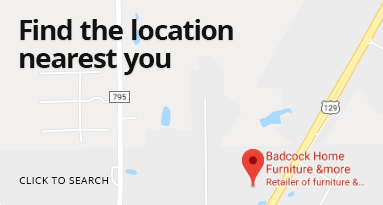 Badcock Home Furniture &more in Cordele, Georgia provides customers with affordable yet stylish home furniture and appliances. We believe everyone has the right to a beautifully furnished home, and we offer easy financing and payment plans to fit your budget. Visit our store at 910 S 7th Street Cordele, Georgia 31015, between Carters Burgers and Churches. We are open Monday through Friday 9:00 a.m.-6:00 p.m. and Saturday 9:00 a.m.-5:00 p.m. You can reach us during store hours by calling (229) 273-6559. We look forward to seeing you soon!